I looked at the publicity images for James Robinson's Starman series with a very dubious eye. Here was a take on one of DC's classic characters that looked to be throwing out everything that I liked about the property. I am glad I gave the series a shot though, because my first impression could not have been more wrong. Jack Knight was indeed hesitant of many of the superhero trappings that his father had, but that made for an excellent character arc where he learned to respect his heroic legacy. Jack's distinct personality coupled with the amazing Tony Harris artwork made this a can't miss series for me. DC seems to hold it in high regard as well - other than a few Robinson-penned appearances as a member of the new Justice Society of America, Jack knight has been able to retire in peace (without being killed off), a rarity in comics. 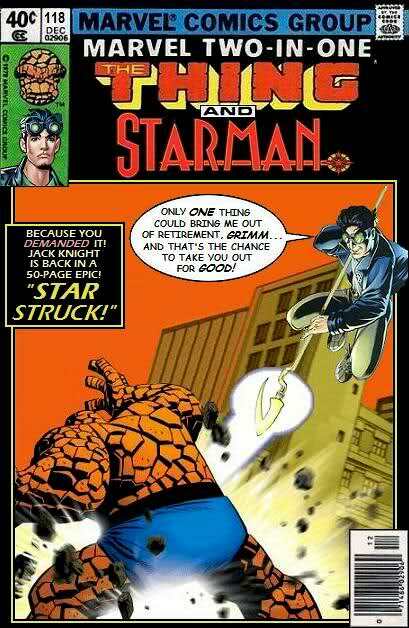 I loved this series when it came out, although I was a bit wary at first because I'd liked the Will Payton version (who was my first exposure to anyone with the name Starman.) I'm still not thrilled with the revised origin Will got, but that doesn't in any way diminish my fond memories of Robinson's series. This is a B-E-A-yoo-tee-full thing!!! I read the first issue of the Will Peyton Starman, and while I liked it...I was just sort of...not really excited about it. Not too long ago, I picked up the enitre run...I'm still - slowly - making my way through it.